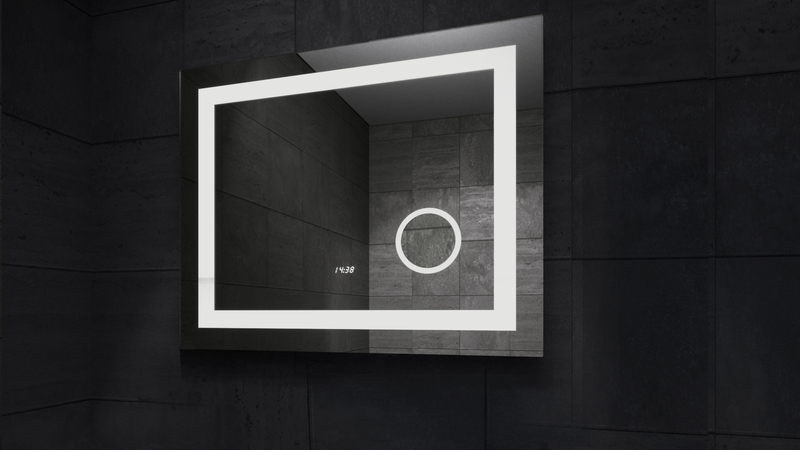 Mega Mirror with perimeter-wise lighting, LED light clock and defogging. MEGA Mirror – New Design. Mega LED Mirror for bathroom is made of quality materials, special glass and European mirror sheet. This model features X3 magnifying lens with lighting in the right part of the mirror, IP44 LED light clock. Upon switching on this mirror, a hand wave motion at the bottom of the mirror turns on the perimeter-wise lighting and the rim around the magnifaying lens. The clock is always in operation, even if there is no mirror lighting. This setting is exclusive in the market of Ukraine and is the pride of SANWERK trademark. Mega LED is a high production complexity mirror. The standard components include: the imported 5 mm thick mirror sheet, the hand wave motion sensor switch, the heating (defogging), the LED light clock, the magnifying X3 lens. Width: 800 mm, 900 mm, 1000 mm.